Unlike the netbooks that broke into the scene a few years back, the GPD Pocket didn’t arrive as a finished product. Like the GPD WIN before it, the Pocket is a product of crowdfunding, and a very successful one at that. GPD pitched the Pocket as its response to backers of the Windows-based, gaming-centric GPD WIN who appreciated the device’s small form factor but wanted a better typing experience than what the clamshell’s thumb keyboard offers. GPD was only too happy to oblige with a slightly larger screen and a larger keyboard. Whether it was able to deliver a better typing experience is, however, debatable. But while the GPD is perhaps one of the most successfully funded campaigns on Indiegogo, its delivery wasn’t as stellar. Units went out over a month late, and the Ubuntu Edition units even much later. But even before backers could get their hands on the fruits of their investment, they saw the device pop up on some online retailers, ending up in a situation where non-backers are able to buy the GPD Pocket even before the backers. There has been no shortage of name-calling, mud-throwing, and even threats to call Indiegogo authorities but, eventually, most, but still not all, backers got their devices. The drama, however, doesn’t end there, as we’ll get to later. While GPD’s behavior, which sometimes included periods of silence, was definitely not ideal, one can’t discount the fact that crowdfunding always carries such risks. While a more established company, GPD is still a relatively small business operating in China. And despite the hiccups and bumps on the road, it was able to deliver for a second time. Hopefully they have learned their lessons already, if there will be a third. 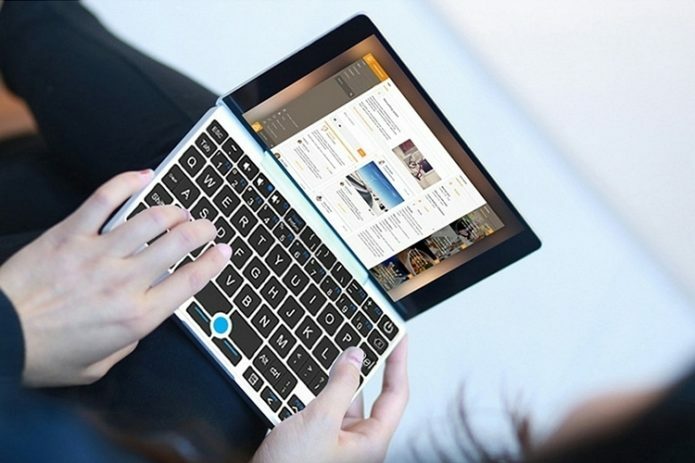 In its pitch, GPD compared the Pocket to the MacBook in terms of design, and it wasn’t kidding. It might be a stretch to put it on the same level as a MacBook Air, but it definitely looks like a miniature MacBook. Unlike a MacBook, however, the GPD Pocket has no visible branding on its cover or even inside, something GPD promised and delivered to satisfaction. For a never before seen device coming from China that costs $509, you might expect some cheap, mass-produced slab. The GPD WIN, which went on Indiegogo for $330, was, after all, mostly a plastic affair. Given that context, it’s almost shocking that GPD was able to pull off the quality of design and build of the GPD Pocket. Much like the MacBook it was inspired from, the GPD Pocket’s body is all metal, giving it not just a sturdy structure but also some heft. At 480 grams, this is no lightweight computer, but it’s not a flimsy one either. Despite its name, you’ll need very large pockets to slip in the GPD Pocket without looking ridiculous. At most, you can probably stow it away inside a jacket or coat pocket, but forget about tight jeans. At 180 x 106 x 18.5 mm, the mini laptop hits almost a sweet spot in terms of usability and portability. Forgot about typing with your thumbs, however, or even using it safely while standing up. The overall design of the GPD Pocket is pleasantly clean. It has an industrial and utilitarian feel to it, much like a MacBook Pro. There are very few ports and holes on the GPD Pocket, and they are all happily located on the right side only. But while that does mean you won’t have cables running out from both sides of the device, it also means that you’ll have to ensure your connects don’t have overly wide connectors. Not that there are many ports anyway. You have, in order, a full-sized USB 3.0 port, a headphone jack, a micro HDMI port, and a USB-C port for both charging and data. That’s pretty much it. Noticeable is the lack of a microSD card slot, which is one of backers’ biggest complaint about the device. GPD believes that 128 GB is enough for this kind of device. At the end of those ports is a grille, not for the speakers, but for the Pocket’s always-on, mostly audible fan. You might want to ensure those holes aren’t blocked at all times. Where are the speakers, you ask? They’re actually behind the keyboard, hiding in between the keyboard and the display hinge. Just as amusing is the microphone location, which is hidden underneath the spacebar. The GPD Pocket is labeled, derisively or otherwise, as a netbook because of two things: it’s diminutive size and is matching diminutive specs. The Pocket runs on an Intel Atom x7-Z8750, the highest model of the now deprecated processor series. The choice of processor isn’t exactly surprising, though still a bit disappointing. Despite having been practically abandoned by Intel, the Atom CPUs are still the most easily available and affordable low-power, fanless SoC small OEMs like GPD can put inside a mobile PC. The difference between an Atom and, say, a Core M in price and power consumption is just too great. Sadly, the choice of the processor does severely limit some of the other hardware GPD can use. For example, that 128 GB of storage is of the slower and older eMMC type, not SSD as some might expect. Amusingly, while the Intel Atom is commonly adopted because of its fanless design, GPD opted to still use a fan in order to push the processor to its full capacity, with rather mixed results. The rest of the GPD Pocket’s specs, however, are rather impressive. It has 8 GB of RAM, which is quite rare for small form devices such as this. It definitely helps in the multi-tasking part of its performance, truly marking the mini computer as a productivity device. Just as impressive is the screen, a bright and vibrant 7-inch panel with a resolution of 1920×1200. Most screens of this size usually default to 720p only, and those that do go Full HD tend to be more expensive. As a point of interest, the screen is actually designed for tablets meant to be used in portrait mode, which is why the display defaults to that orientation. It’s not all roses, however. As mentioned, there is no storage expansion option on the Pocket, forcing users to plug in a USB flash or hard drive as the need arises. There is also no built-in 4G mode, which is becoming more common on laptops. That, however, would require far more costs and certifications than both GPD and its buyers might care to pay for. And finally, the 7,000 mAh battery is advertised to give 12 hours of use, which is the most optimistic, in fact unrealistic, estimate you’ll hear from a manufacturer. That all looks great on paper and in photos, but the big question is whether it translates into the real world. This, unfortunately, is when the dream starts to break down a bit. The situation isn’t clear cut, however, especially without a more or less standard benchmarking tool for Linux like you would find for mobile or Windows. Truth be told, the Intel Atom processor is largely underestimated. Throw in 8 GB of RAM and an active cooling system and you have the makings of a rather potent portable PC. Multiple browser tabs are no problem and so are multiple open applications. No, processing power isn’t your enemy here. Thermal throttling and management is. The Intel Atom isn’t meant to be taxed to much, and, when it does, it crashes down hard. GPD applies a rather low thermal limit but when all cores are utilized and temperatures reach around 65C, you can find yourself looking at a completely frozen device with no other recourse but to hard reboot. Some have reported that disabling Intel’s Turbo Boost, which wold have let the CPUs go all the way from 1.6 GHz “safe” max to 2.4 GHz, resolves that. I’ve found it to be a hit or miss situation though. More adventurous users have opened up their GPD Pockets to replace the thermal paste with satisfactory results, but it’s not a path majority of owners will be willing to take. Causes for temperatures to rise up can be pretty random. Sometimes it will happen when playing a YouTube video, sometimes when just changing some settings. Gaming is definitely one sure-fire way to hit those numbers. So while the hardware is quite capable of playing even 3D games in low settings, be prepared to always save a lot. The fan is, ironically, always on. Unlike the GPD WIN, there is no hardware switch to turn it off. But also unlike the GPD WIN, the sound that the fan makes is quiet perceptible. It isn’t loud mind you, and it is easily drowned out by ambient noise. But it’s always there, like a mosquito buzzing around your ear. Given how audible it is, you’d hope it were powerful enough to keep the CPU always cool, which sadly isn’t the case. Don’t expect the GPD Pocket to be a portable multimedia station either. At least not if you’re quite picky about sound. The tiny speakers produce tiny and tinny audio, with noticeable distortions at max volumes. On Linux, because of driver issues, there is also some crackling artifacts that could drive you nuts. All in all, the GPD Pocket is a surprisingly powerful portable PC that will serve you well on common, non-intensive computing tasks when you’re out and about. It could even work as a portable media player, if your ears can take the somewhat low quality audio. And you might even be able to play a few rounds of a game in the lowest settings. Just be aware that, at any point in time, you might yourself wishing you had hit save on that document or game before the CPU crashed. GPD claims the Pocket has a 12 hour battery life. Reality is that you’ll be lucky to hit 6 hours of continuous mixed use. Watching videos back to back will naturally drive that number down lower, if it doesn’t overheat first. The great thing about the Pocket, however, is that you can top it off an external battery pack any time, provided it has enough wattage to keep up with your use. The GPD Pocket keyboard gets its own section because, in truth, it is what defines the device. It is also what both makes and breaks it at the same time. Unlike the keyboard on the GPD WIN, the Pocket’s keyboard was designed to be typed on like a laptop and for longer typing periods. But make no mistake, your hands will feel cramped after that long period thanks to the equally cramped keyboard size. The keys themselves are not that small, but when you add the space between them, you get a keyboard where your fingers will tend to hit the wrong key more often, or, in some cases, even hit your other fingers. That said, the keys have a surprisingly good travel to them. The above is expected and almost forgivable. But what makes the keyboard a less than stellar typing experience is the unorthodox and honestly broken keyboard layout. Just look at the image below and try to play a game of “spot the difference”. The Delete key is below and bigger than the Backspace key, some keys, like Caps Lock and “A”, are lumped together that you’re sure to hit one instead of the other. Perhaps the one genius feature is that the power key, which sits so precariously close, has to be pressed harder than any other key, preventing accidentally triggering it. It is, to some extent, somewhat understandable that GPD had to make compromises in order to fit the same number of keys on your laptop into a 7-inch diagonal space. There were suggestions on how to improve the layout before the campaign ended. Almost none of those seem to have made it through. There is obviously no room for a trackpad here. Instead, GPD borrows from IBM/Lenovo the trackpoint, except place way at the bottom. To some extent, it works. You do miss out on scrolling gestures, but the screen is a touch screen after all. The one complaint I have is that the left and mouse buttons are also so close to the oddly split Spacebar, leaving a lot of opportunities for error. We’re taking the software last because it is the most variable aspect of the GPD Pocket, and also perhaps one of its biggest strengths as well. Officially, there are only two editions of the device, one with Windows 10 and one with Ubuntu 16.04 LTS. Those with the Windows 10 version, with a BIOS update, can also install Ubuntu, and those on Ubuntu with a valid Windows 10 product key can install Microsoft’s OS after the fact. It doesn’t end there, however. Just like a regular PC, you can install any operating system on it, from your choice of Linux distribution to even versions of Android for the PC. For its part, GPD has complied with Linux’s open source license and has provided the source code of its kernel. And being an open source operating system, those with enough expertise can take a peek at how GPD’s version of Ubuntu differed from the pristine version. Indeed, a rather active community of Linux users have already sprung up around the device, with ready-made custom versions of Linux to install or instructions and stories for installing other distributions. You are practically just limited by the drivers available for the device’s hardware, which aren’t exactly esoteric. This has quickly made the GPD Pocket one of the most popular portable computer for hackers, modders, and Linux power users, despite some of the flaws mentioned earlier. So who is the GPD Pocket for anyway? GPD, somewhat comically, talks about a fashionable woman fashionably sipping coffee a shop while gracefully chatting with her girlfriends. Never mind the sexist stereotype, but most people, men or women, would probably do so better and more comfortably on their phone. GPD also talks about a Linux engineer, also drinking coffee, of course, typing away on Vim to write programs. Those must be very short programs, otherwise their hands will quickly get sore. Snarkasm aside, the GPD Pocket is actually a perfect fit for computer users, Windows or Linux, who think they will eventually need to use the computer on the go but don’t want to bring a full-sized laptop along. It’s for the social media manager who needs to be able to quickly post content faster than they can thumb type on a phone. It’s for the system administrator who has to remotely log into a server. It is for the every day computer user who wants a portable computer that actually offers all the bells and whistles that a regular desktop operating system has to offer. And, yes, it might also be for the novelist writing bits and pieces of chapters here and there, the hip programmer sipping coffee while developing the next Facebook, or the tech journalist writing a lengthy product review. Just remember to give your poor fingers a break from time to time. So is the GPD Pocket, like the netbook, a solution in search of a problem? Quite so. But, at the same time, it is also an answer to the wishes of no fewer than 8,500 backers, even if the answer was delivered in a less than perfect package. The GPD Pocket is definitely a curiosity. It is powerful enough for average computing needs, open enough to run almost any platform, small enough to almost fit your pocket, and, yet, also too small to be a comfortable every day, all day device. As much as some of us may wish it to be so, the GPD Pocket isn’t going to be your primary computer. It’s more like that spare laptop you take when you have an unplanned trip. You could use it as your one and only computer, but, for the sake of your health, you’ll want to attach an external monitor, keyboard, and mouse. But at that point, the GPD WIN might make for a better mobile companion and makeshift desktop that can let you play games or type even without a table in front of you.